Judith Paul personifies individuality in her work as well as her lifestyle. A kaleidoscope collector by addiction and an art conservator by vocation, she lives with her husband, Tom, and more than 400 kaleidoscopes. She likes to say that she will not give up either! 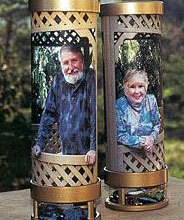 Since 1998, Judith has been in collaboration with Tom, and they make both production and limited-edition kaleidoscopes. Tom has studied mirror-making with many of the best in the field, and enjoys the pursuit of perfection. He has a trained eye, patience, and the determination to master the difficult, and critical part of a kaleidoscope that creates the “mandala”, the term for the interior image. Judith has degrees in art from Brown University and the University of Chicago, and studied at the Rhode Island School of Design and the Art Institute of Chicago. She is a professional Art Conservator and cares for many private collections. She is charge of design—and shopping. Judith also designs and makes limited edition kaleidoscopes for the very serious collector.